The Hand of Fatima is a sprawling historical novel, set in 17th century Spain when the Christians had defeated the Moors. Nearly 900 pages long, it’s a blockbuster, successor to Falcones’ European bestseller Cathedral of the Sea. 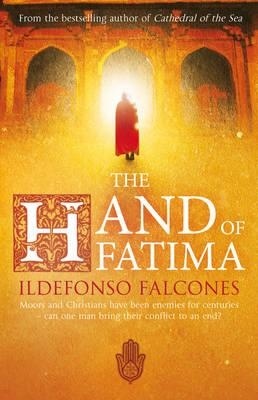 Judging by The Hand of Fatima and the blurb about Cathedral of the Sea Falcones is interested in historical religious conflict as well as the usual staples of blockbusters (love, betrayal, war, injustice, see–sawing fortune and human frailty). What elevates The Hand of Fatima above the ordinary is its subject matter: the expulsion of the Moors by the triumphant Christians; Cathedral of the Sea apparently involves the Inquisition in 14th century Spain and its treatment of the Jews. The imposition of one religion over another seems especially pertinent at the moment as ISIS advances on Baghdad, bringing its triumphant medieval caliphate to one Iraqi city after another. Women especially seem to bear the brunt of these religious wars. Certainly the women in The Hand of Fatima do. The title refers both to a forbidden religious symbol and Fatima’s hand in marriage. For all that the novel bears her name, in this plot-driven novel, Fatima isn’t a fully-fledged character: she’s a beautiful woman doomed to be alluring to men who seek to possess her. Without giving away the plot, suffice to say that she has a rough time of it. But all the women do: even the rich Isabel has no right to self-determination. She is a possession too, and her punishment for cuckolding her husband is severe. (To say nothing of what happens in good time to her lover). The flawed hero of the novel, Hernando a.k.a. Ibn Hamid is the blue-eyed son of a priest who raped his Muslim mother in the town of Juviles in the Sierra Nevada. Aisha is married to a brute called Brahim, and the fate of her children is shocking. The Christian authorities suppress insurgencies with summary executions and enslavement; they tolerate the Moriscos (Muslims forced to convert) as an underclass doomed to poverty and oppression. But of course the Inquisition is always busy. Moriscos aim to keep under the radar in order to survive, and they practice their religion and culture covertly. Hernando, caught between Catholicism and Islam, is always suspected by both sides. Intelligent, determined, and with enough initiative to last the full 900 pages, Hernando moves adeptly between the two religions, knowing the one because his father the sacristan taught it to him, and the other because he comes under the influence of the Holy Man, Hamid, who becomes a substitute father to him. His fortunes in true blockbuster style vary enormously: imprisoned and free; backwards and forwards between rich and poor; from desperately alone to happily married and oh dear, though not by design, to more than one woman at a time. As you’d expect, the wives have a lot of children, but hardly any of them survive, and the novel sweeps on regardless. Hernando is befriended by men in high places who value his skills as a scholar: despite his humble beginnings, he is – thanks to his two fathers – literate in Arabic, Castilian and the local dialect. For these devout Muslims masquerading as devout Catholics Hernando takes on the covert work of translating, copying and distributing holy works including the Koran, but the danger of this work means that it must be kept secret. The Moriscos interpret his close companionship with Catholic church hierarchy as betrayal, especially since in a rare moment of genuine humanity in this novel he rescues a Spanish grandee from certain death during the doomed Morisco uprising. Hernando feels (as many of us do) that reconciling the two religions would be a good idea, so he begins an ambitious plan to do just that, using his understanding of both religions and his literary skills. This involves lots of interesting skulduggery but perhaps rather too many slabs of text explaining its intricacies. Subtlety of characterisation is not usually a feature of blockbusters. The brutes Ubaid and Brahim are unreservedly brutish with no redeeming features at all, and no backstory that might explain their brutishness. The rich, powerful Catholics are mean because they can be, while the poor ones are all lazy. The women are stereotypes: brave, faithful, devoted to their children and occasionally ruthless with a dagger when roused. A dramatis personae might have been handy to keep track of the huge cast of characters, especially the ones who seem to resurrect themselves from too many chapters ago. The only real character development is Hernando’s, and yes, there is a satisfying moment when he becomes a sadder but wiser man in the two-hankie scene on the wharf at Seville. Will this novel be made into a movie? Oh, I hope so. I loved visiting Spain, and The Hand of Fatima includes scenes in Granada, the Cathedral of Cordoba and Seville which would make the film a visual delight. Source: Christmas gift from The Offspring and his lovely wife.